The Library is Kdenlive’s way to copy and paste sets of clips and transitions between different projects. As its name already hints at: it is not just a clipboard, but instead it is a library for all the things you in more than a single project. The Library came to life around Kdenlive 15.04 or so. Let’s right dive into how to use the library in your daily Kdenlive workflow! The Library is Kdenlive’s central place for copying and pasting between projects. If you don’t see yet the library pane, make sure to display using View > Library. The library should look slightly familiar, as it looks similar to the project bin. However, while the project bin changes with each project, the library is independent of your projects. It’s always the same library, there’s only one of it. A quite useful Kdenlive window layout is to group the library together with the project bin, and optionally the project notes. This way, you don’t need extra screen space for the library, yet it is no further away than just a single click. Next, select some timeline clips (together with their effects), as well as transitions, in the timeline. You can load an existing project and select some timeline clips and transitions at any time in order to copy it into your library. There is no separate import. Simply load a project or create a new one. Switch to the library pane, if you haven’t yet done so. Then press the bookmark button (Add Timeline Selection to Library), which is located at the bottom of the library pane. It’s the third button from the left. Kdenlive now asks you to name your new library item. Give it some name, and click OK to copy the selected timeline clips (with effects) and transitions into your library. Please note: at this time, the names of library item need to be valid filenames. Of course, you can even neatly organize your library items into folders, and subfolders. 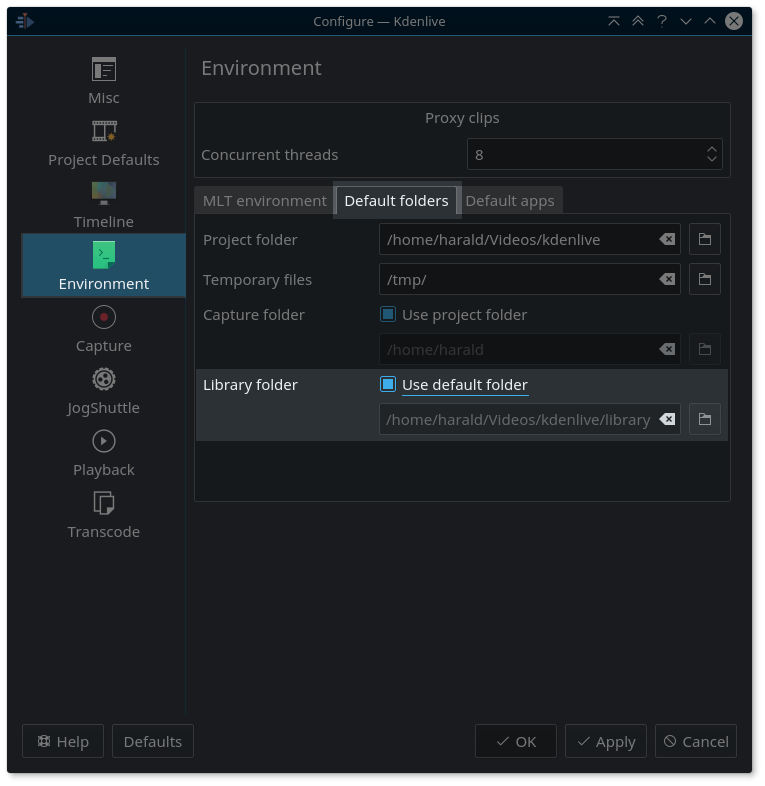 This is similar to what you may have come to known from Kdenlive’s (project) bin, where you also can use folders to organize your project (source) clips. Use the Add Folder button at the bottom of the library to create a new folder. You can rearrange library items and folders at any time by simple dragging them into their new place. Now switch to another Kdenlive project by loading it, or alternatively start with a fresh project from scratch. Next, go to the library pane and select the library item you want to paste into your project. Then, press the Add Clip to Project button (up to Kdenlive 16.08.1 this is instead the “+” button, located in the same place). Your project bin now contains the new library item you’ve just added. You can rename library items at any time: right click > Rename Library Clip. The selected library item has now been added to your (project) bin. You’ll see this by switching to the (project) bin pane. You still have only a single (library) clip at this stage. You can now drag it into the timeline, whereever you want. Please note: you cannot directly drag a library item from the library into your timeline. You always need to add it to your project bin first. Often, you next want to edit the contents of a library clip after you’ve placed it on the timeline. Expanding means that you want to break up a library clip into its contents for further editing. So, simply select the library clip in the timeline. Then choose Timeline > Current Clip > Expand Clip. Done! You can now edit the expanded contents as you would edit any other timeline content. Kdenlive has expanded all the clips inside the library item into its own bin folder. This bin folder has the same name as the library clip, but without the .mlt extension. After successful expansion, you may now remove the original library clip from your bin. It’s not needed anymore (as you can also tell from the missing reference count). Before Kdenlive 16.12.0, library clips will be expanded from the bottom up; which may be counter-intuitive (depending on your point of view). Here, bottom up means that in case a library clip contains multiple tracks, then you need to place the library on a lower track so there is room above for the clip to expand. From Kdenlive 16.12.0 on, the contents of the library clip will be expanded down from the track where it has been placed on and below. That is, place your library on an upper track with suitable room below. Anyway, if there aren’t enough tracks below the library clip, yet there are enough tracks in the timeline, then Kdenlive will attempt to shuffle the library clip up a number of tracks, before then expanding it. In any case, to expand a library clip into its contents, you’ll always need necessary free space in the timeline. This means that there cannot be any clips or transitions within the start and end of the library clip on as many adjacent tracks as to be needed when expanding a multi-track library item. Simply put: just make sure that the library item has room to expand, otherwise there can be other clips and transitions above and below the library clip, they just need to be out of the area of expansion. Please note: starting with Kdenlive 16.12.0, you can also expand a library immediatedly below a transition; that is, the library clip is on the next lower track in the timeline. This is useful for such cases where you, for instance, have a clip running the full length of your project on the topmost track and showing your company logo, channel logo, or something similar. If you then use an explicit transition added to this clip over compositing, you can still correctly expand the library clip on the second-topmost track. All items in your Kdenlive library are stored in a user-configurable place inside your file system. The default location, unless configured otherwise, is where your other semi-temporary caching data is stored. Typically, this is $HOME/.cache/kdenlive/library. You library clips are then stored inside this directory, as well as in subdirectories in case you also use library folders. To change the location of your library, go to Settings > Configure Kdenlive. Next, select the section Environment. Switch to the Default folders tab. Locate the part titled Library folder, and deselect the option Use default folder. Select or enter another location for your Kdenlive library. Please note: Kdenlive won’t move existing library files to the new location you’ve set. You’ll need to do this manually using a file browser or from the command line. Kdenlive’s library items are kind of simplified project files. More specific, they are so-called MLT playlists. These are XML files, so you can easily look at them to find out more about them. 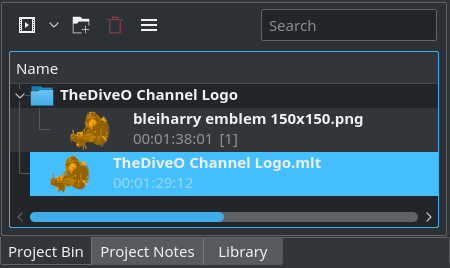 Playlists, as opposed to full-blown Kdenlive projects, lack certain project information, such as clip markers and timeline guides. Also, Kdenlive does not support exporting track effects into playlists. So, Kdenlive’s library is a neat user interface around exporting timeline clips with their effects, as well as transitions into MLT playlist files, and later for importing them into another project. You may have already wondered what Timeline > Save Selection is good for? It’s the export mechanism underlying the library. The library just makes it easier to use as you don’t need to worry about where to store all your library clips. My Kdenlive doesn’t have library. Is it possible to download the library widget from somewhere? Or, if I’d download the latest version of Kdenlive, can I import old projects there? Install the current Kdenlive release, which is 16.04.2 at the time of this writing. I don’t understand why you want or need to import old projects? Simply load an existing project, select clips and transitions in the timeline as described in the article, then add them as a new item to the library. Done. Just follow the description. My kdenlive shows it is 17.03.70 version . is this the latest version ?? Yes, 17.03.x is the current development code that contains all recent changes. However, if you want to work with Kdenlive, it is recommended to get the 16.12.x branch that is the last stable version. My library clips are being rendered as compressed files, as though they are proxy clips; I want to render them in the higher-quality WebMP format instead. The only clue I have as to what might be wrong is that when I import from the library into the project bin I receive a message that says the proxy file is missing and will be recreated on project opening. How can I fix the timeline clips so that they are of higher quality during rendering? Thanks. Sounds as if you are adding proxied clips into your library, so this seems to become sticky. Can you expand the library clip and then disable proxy clips on the imported project bin clips? I suspect that a clean way would be probably to never add proxied clips into the library. The library has difficulty with the title clips. The background becomes black and loses transparency. Also if you import clips with kdenlive titles becomes inaccurate, it takes a lot of time to expand them, sometimes losing track with the actual video. If the titles are taken away, everything comes back perfectly. Ioris, can you please head over to our forum to get help? One thing I can’t understand is how title clips should loose transparency, because to the best of my understanding they don’t have any background, but I may be mistaken here. Or is there such a title parameter in the title dialog andand its value might get lost? In any case, it would help us if you can give a minimized project and the library clip so the devs can try to reproduce your issue, because otherwise it’s difficult to fix a potential bug. I will certainly point it out as a possible problem for the forum today. The titles have the opaque background and are not transparent, and they do not let you glimpse the video placed on the track below. This one with a .mlt clip library, then i try to expand the title, the transitions, and the video tracks disappear. I’ve done dozens of tests to make sure the problem is recursive. I apologize, in what part of the forum is best to expose this problem? Hello Dive0 I posted on the forum, but for now no response, from anyone. If I can write to someone in particular, I’m happy to collaborate. The normal way now is to file a useful bug report on https://bugs.kde.org/ for the Kdenlive “product”. The bug report needs to specify the OS distribution you’re using, as well as whether you installed from distro repositories or from other repos, such as the official Kdenlive ppas. Most important, make sure to attach a minimized(!) regression project that triggers the bug reproducibly. Minimized means that you need to remove everything not needed to trigger the bug. I know that this is a daunting task. But no dev likes to wade through lots of cruft that isn’t relevant to the bug report. The key here is to boil everything down to the barest minimum. Don’t reference any external file hosters, don’t use megabytes of video files. No-one will look into the issue as long as there isn’t an easy way to reproduce and then debug. Include a short and concise description of how to reproduce the bug given the regression project you’ve attached. So, the minimzed(!) example project is crucial. It also allows us to see what you are actually doing, so hopefully we can see what’s going wrong. At this time I don’t understand what is happening in your projects; I’m working a lot of the built-in title editor, heavily misusing titles even as quick-and-dirty mattes for deemphasizing unimportants regions of video in my tutorials. I haven’t seen your bug yet, but let’s hope we can drill down to its cause. Can you please ping me here with a link to your bug report after you’ve filed it on bugs.ked.org? Version 16.12.1 AppImage running on Ubuntu. I’m creating a title/marker of 3 pngs and affine. Clips are saved in the library, when I vim the .mlt, it has both the .png and the affine. It was difficult to save all 3 clips together as one .mlt, but even when I could and it had all three .png and their affine, I still had the following issue. When I switch to a project where I want to use them, drag the clip from the library to project, then project to timeline, the clip never has the affine with it. No transitions follow the clips into the timeline. Normally, the transitions should be *inside* the .mlt library clip, so you cannot spot them in the timeline. Until you expand the .mlt clip in the timeline to get back its individual contents, including transitions. When selecting timeline elements for storing them as a single clip in the library, I typically use the rubber selection (click, hold, and drag the rubber selection) around the stuff I want to put into the library. While I worked a lot with 16.12, I don’t have experience with the AppImage version, only the Kdenlive ppa master releases. But I don’t remember specific issues with the library at this time, but my memory might well serve me wrong. Can you test with the recent 17.12 AppImage? They are. As I said, I can edit with vim and they are there. > Until you expand the .mlt clip in the timeline to get back its individual contents, including transitions. And that’s where they aren’t. They don’t show up in the timeline, and they don’t appear in the preview and they don’t end up in the final render. I drag the entire library folder that has the clips in it that I use, into the project bin, then drag the clips one at a time from the project bin into the timeline. No joy. The transitions are not kept. I have to edit them back in each time. Completely defeats the purpose of using the library. To make matters worse, it shortens the clips to an arbitrary 10.1 seconds AND DOESN’T LET ME LENGTHEN THEM NO MATTER WHAT. So, I basically have to go find the sources, drag them into the project and do all the effects every sing time. It appears the library looks nice, but doesn’t work. How many tracks are used in your library clip, and where are the transitions that got lost during expansion in the timeline? Are you expanding with enough timeline tracks above and below it? > and where are the transitions that got lost during expansion in the timeline? Not sure what you mean. The transitions are for the entire clip that I copy down to the timeline. I’m using affine to scroll two background bars into view and then fade text over them, and then fade the text out, and then scroll the bars back off screen. Two bars, two texts (all are png), so 4 total clips. The affine exist for the entire period of time of the clip, and doesn’t copy down at all. > Are you expanding with enough timeline tracks above and below it? Yep. The clip copies down just fine. Affine never shows up, I have to recreate it every time with all the fade in/out points. This sounds like small enough example to work as a regression test. Can you please file a bug report? (link to it should be in the footer of every page on this site.) Please attach the library mlt clip; the source clips are probably not necessary if I’m not mistaken.